The ActiFry multi-cooker is the perfect way to prepare healthy, tasty holiday food for family and friends. This article is sponsored by ActiFry, a low-fat multi-cooker that uses just one tablespoon of oil. Learn more about ActiFry at www.tfalactifry.com. The holidays are upon us. Which means plenty of hours will be logged at the dinner table surrounded by friends, family...and a smorgasbord of food. But just because we'll be enjoying our favorite holiday fare doesn't mean we have to indulge like gluttons. The key to a healthy diet is not only eating nutritious foods, but eating meals that were prepared with healthy cooking methods. If only there were a way to decrease the amount of oil we use to prepare these dishes without sacrificing any of the taste. Well, now there is. With the ActiFry multi-cooker, you can prepare tasty homemade meals large enough for the whole family with only a single tablespoon of oil (and, sometimes, no oil at all). Through a proprietary technology that uses pulsed hot air and a rotating stirring paddle, this automated multi-cooker can prepare up to 2.2 pounds of your family's favorite foods--from low-fat french fries to Korean fried chicken wings to a flavorful bolognese sauce. The cooking couldn't be simpler: Place the ingredients in the ceramic non-stick pan, close the lid, set the timer and switch your ActiFry on. You can monitor the progress of your meal at any time through the ActiFry's 100 percent transparent, steam-free lid, or just wait until the audible timer lets you know it's done (click here for a demo). Clean up is even easier: Simply take it apart and toss it in the dishwasher. There couldn't be an easier or healthier way to feed your family and friends. Of course, every chef is only as good as his or her recipes, which is why we are sharing a few of our favorites to ensure you'll be the most popular dinner party host this season. For more ActiFry recipe's, visit www.tfalactifry.com/recipes. 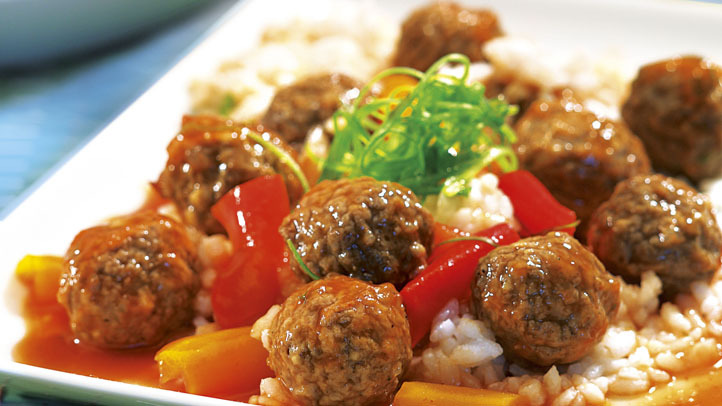 Make meatballs to your own liking and freeze overnight. Place the meatballs and peppers in the ActiFry pan. Whisk apple juice with the ketchup, mustard, maple syrup, cider vinegar, onion, garlic and cornstarch. Add to the ActiFry pan. Cook for 20 minutes or until meatballs are cooked through and sauce is thickened. (Add a couple extra spoonfuls of juice if the sauce becomes too thick.) Sprinkle with coriander (if using); serve over rice (if using). Variation: For a tropical version, stir in 1 cup drained pineapple chunks when adding the peppers. 1. Place the onion, red pepper and hot chili peppers in the ActiFry pan. Drizzle evenly with the oil. Cook for 5 minutes. 2. Crumble the beef into the ActiFry pan. Cook for 5 minutes or until the meat is browned all over. 3. Whisk the tomato paste with ¹⁄3 cup of the broth, the cumin, coriander and chili powder. Add the broth mixture and tomatoes with juice to the ActiFry pan. Cook for 25 minutes. 4. Add the kidney beans and remaining broth to the ActiFry pan. Cook for 10 minutes or until beans are heated through. Season to taste with salt and pepper (if using). Variation Substitute mild chili powder for a less spicy version. Slice the tortillas in half, and then cut them into 1/4-inch strips. Add them to the ActiFry and coat evenly with 1 tablespoon of oil. Cook for 10 minutes until crispy and lightly browned. Check after 1-2 minutes of cooking to ensure they remain distributed in the pan, stop to breaking up any clumps with a wooden spoon. Remove them to a medium bowl, toss with salt and reserve. Add the red pepper and onion, and 1 tablespoon of oil and cook 20 minutes until softened and lightly colored. Remove to a plate and season. Add the chicken, 1T oil and cook 7-8 minutes until just cooked through. Check while cooking to ensure chicken remains distributed in the pan. Add back the pepper/onion mixture, add soy sauce and Thai basil, to heat through. Serve with crispy tortilla strips on top, and the avocado on the side. Wash and trim the green beans and cut them on the bias into 1 inch pieces. Put the almonds into the ActiFry pan and cook for 3 minutes. Add the green beans to the pan and drizzle with the oil. Cook for an additional 7 minutes, until the beans are crisp-tender. 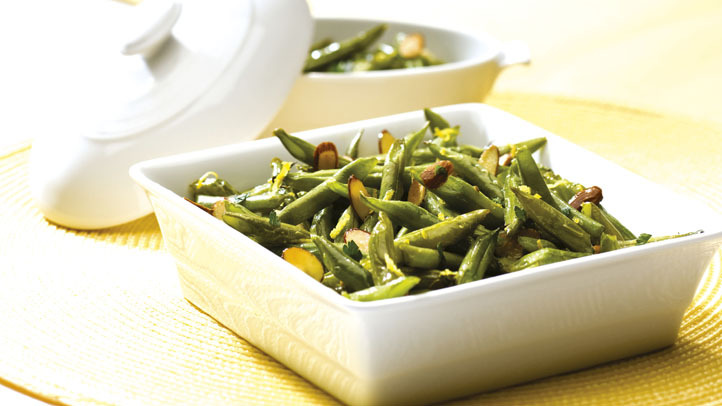 Transfer the green beans and almonds to a serving bowl. Add the lemon zest, lemon juice, and parsley and stir to combine. Season with salt and pepper. Serve warm or at room temperature. Cut off the crown and the lower part of the pineapple. Cut it into eight lengthways. Remove the core and the skin and chop the flesh into cubes. Place the pineapple pieces in the ActiFry, pour in two tablespoons of honey and cook for 10 minutes. Meanwhile wash the figs and cut into quarters. Add the figs with the remaining tablespoon of honey, the lemon juice and the cinnamon. Cook for 4 to 5 minutes. Serve the pineapple and figs with vanilla ice cream.